Syrian warplanes launched air strikes within the Menegh military airbase in the northern province of Aleppo on Saturday after rebels stormed parts of the regime garrison, a watchdog said. The fierce retaliation came after the insurgents, who have been attacking the base daily for months, succeeded in breaking into several areas, the Syrian Observatory for Human Rights reported. The airbase is less than 25 kilometres (15 miles) from the border with Turkey, a key backer of the rebellion against President Bashar al-Assad’s regime. Insurgents have also been launching protracted assaults on the Nayrab military airport just outside the second city of Aleppo and Kweyris airbase elsewhere in the largely rebel-held province. Regime forces, meanwhile, carried out air raids on the southern district of Qadam in Damascus and across the eastern outer belt of the capital, where rebels have their rear bases, the Observatory said. Warplanes also raided rebel positions across the southern outskirts of Damascus as the military presses a major offensive against rebel zones in efforts to break a stalemate in the two-year uprising. Elsewhere on Saturday, a child was killed in shelling on Qusayr as warplanes raided Rastan. Both cities, in the central province of Homs, have been under daily bombardment for a year. In Homs city, where hundreds of civilians have been trapped for months by an army siege of rebel-held districts, troops renewed shelling those areas, the Britain-based Observatory said. 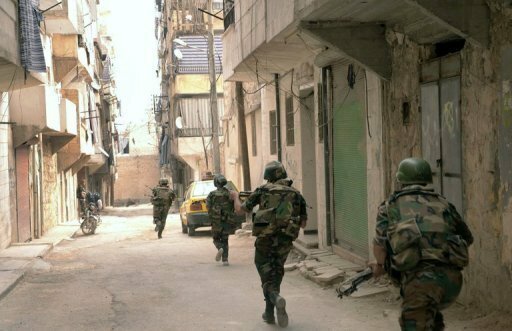 Clashes also broke out in the eastern city of Deir Ezzor and in the southern province of Daraa. The Observatory, which gathers its information from a network of medics and activists, reported at least 15 people killed on Saturday a day after 136 deaths nationwide. A UN figure puts the number of people killed in Syria’s conflict so far at more than 60,000.